Weasel's Journey: Some enchanted evening. I have a running joke with my kids that they had better be able to name my favorite songs. Dots chides me because I don't have them ranked past number four, but she definitely knows that I Left my Heart in San Francisco is in my Top Ten. Suffice it to say, when I saw that Tony Bennett was coming to Dallas to perform at the Morton H. Meyerson Symphony Center, I quickly secured tickets for Robert and his mother and me. We stopped for drinks and hors d'oeuvres at Hibiscus and sat at a table by their fireplace, which was a perfect start to the evening. I even ran into two friends from my Monday bridge game who ironically had just been telling their dinner companion about my blog! We arrived at the Meyerson and found our seats just before Tony Bennett came on stage. Accompanied by a piano, guitar, string bass and drums, Tony Bennett sang many familiar favorites interspersed with stories of their origins. He was lively and engaging, and his voice was remarkably strong and vibrant; it's hard to believe he's 82 years old! Among my favorites that he performed were Cold, Cold Heart, For Once in my Life, Stepping out with my Baby (where the guitarist played snippets of Marty Robbins' El Paso and The Yellow Rose of Texas during an interlude) and of course, I Left my Heart in San Francisco. But the highlight of the evening was when Tony Bennett turned off his microphone and sang Fly Me to the Moon without amplification. 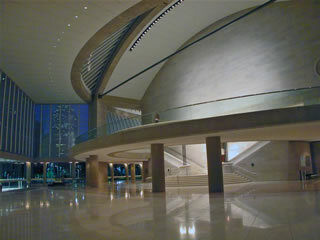 The audience was silently mesmerized as his magical voice resonated through the Meyerson. Sounds like a great evening! And what a beautiful venue. Hi. Thanks for the stocking info. I had a feeling you made them. I am in the process of needlepointing Molly's stocking, but it will not be done in time so I am searching for a replacement unitl its done. Glad you and your sister liked Garden Deva! wow - what a great night!! Oh my, I might have swooned. What a fabulous memory to have! Sounds wonderful!! He's in a leaque of his own, just like Sinatra was. That sounds like a perfect evening for me. Truly. What a wonderful evening! Aren't you excited for the DCPA to open? It will bring so many more amazing arts events to the city!